In a significant act of political signaling and foresight, Chinese Premier Li Keqiang chose India as his first ever overseas destination after taking charge of the premiership. He arrived in New Delhi on Sunday evening and held meetings with Indian Prime Minister Manmohan Singh first. He also met Singh’s cabinet colleagues and flew to Mumbai and met with Indian industrial leaders. This visit is important in more ways than one. At the purely bilateral level, an excruciating border episode was just recently brought to a close. On a global level, the two countries are dealing with a once-in-a-century churning in the architecture of global governance, while at the same time trying to shake of the lethargy that both economies have fallen prey to. For the first time in many centuries, this continent has the wherewithal to define itself on its own terms. Capitals in Asia will lead the process of shaping the Asian project. China and India must be partners in this effort, and to get there they need to deal with the hard questions, as the time for sweet talk is now over. We need to start having brutally frank conversations on our legacy problems and on the more recent challenges. The parroting of old staid positions and whispering of diplomatic sweet nothings will yield little and allow others to intervene and impose. It is time for the two countries to grow up and resolve the disputed border. And even as this resolution is discovered, progress on the bilateral relationship must be insulated from this process. For this to happen, political leadership in both countries will have to demonstrate courage to make their respective security establishments toe the line. Economic integration is not and will never be the answer to this political poser alone. It can provide the motivation for seeking a resolution, but it is not the answer by itself. In fact, it can now be argued that the political discord and public perception in both countries are limiting greater economic integration. Trade shows signs of plateauing, with Chinese firms struggling for access to all projects in India, be they shipyards, roads or telecommunications, despite some early and spectacular inroads. The two countries now need to realize that they are confronted with the political moment that has been deferred and delayed but cannot be denied. Strong and purposeful measures must be crafted. There must be a bold statement on the border issue that no matter what the differences, incidents like that in Ladakh recently will not happen again. While the border management pact recently offered by China may not be the answer, an equitable arrangement that prevents any troop movements remotely close to each other’s claimed territory must be worked upon. This conversation cannot be delayed. And the process of arriving at this accord needs to be a lot more transparent. Opaque political discussions lead nowhere, and public opinion must be built and sought. China’s engagement with India must transform from one that is largely seen as transactional, such as the selling and buying of goods and commodities, and more recently functioning as a lender, to one of being a long-term investor and stakeholder in the Indian economy. Chinese money, businesses and investments must bet on India and be located in this country. This cannot happen however until businesses and people in China begin to perceive India as a friendly destination, an outcome equally determined by Indian attitudes to China. India for its part must seriously consider identifying special industrial zones that Chinese firms can develop as centers of large manufacturing and R&D. There must be a complete, honest and meaningful revamp of the current visa regime. The level of visits is abysmal, and security considerations cannot determine the level of engagement between the two countries destined to be the largest trading partners in a decade or so. Finally, the two must bilaterally develop a substantial conversation on the cutting edge of global governance issues, including issues of the global commons like climate change, water, health and medicine, and Asian security architecture, as well as issues of space and proliferation, of rules and mechanisms of economic governance, and on new arenas of maritime and ocean governance. This dialogue must help discover common ground that the two countries can articulate and put forth for the consideration of the global community. Such articulation will be the first step toward an Asian century. 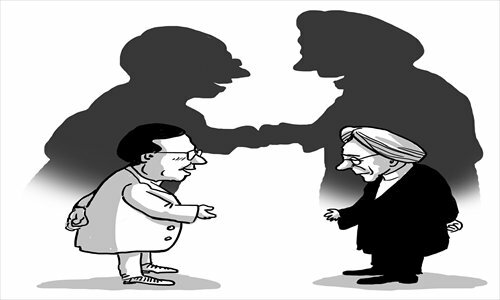 Ultimately a political Asia will be born when New Delhi and Beijing can assume parentage of this Asian geography that until now has only seen many guardians.